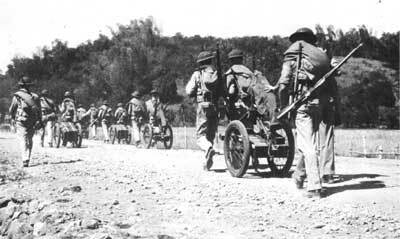 After the movement of the 4th Marines to Corregidor in December, there were still Marines on Bataan. Two antiaircraft batteries operated in the Mariveles area and formed part of a naval defense battalion for the southern coast of Bataan. Battery A, commanded by First Lieutenant William F Hogaboom, was stationed at the Mariveles Quarantine Station, protecting an old Dewey Dry Dock. The battery consisted of two officers and 80 men and was armed with nine machine guns for low level antiaircraft defense. One Navy officer and 65 sailors were attached to the battery Battery C, under First Lieutenant Wilfred D. Holdredge was posted in an abandoned rice paddy between the Navy Section Base and the village of Mariveles. The battery was composed of four 3-inch antiair craft guns and had an ensign and 40 sailors attached. General MacArthur learned of the presence of Marines on Bataan and ordered Battery A to serve as a guard for USAFFE Headquarters. The officer in charge of the Naval Battalion, Commander Frank J. Bridget, then directed Lieutenant Hogaboom to return to duty at Mariveles instead. On 14 January MacArthur wrote directly to Admiral Rockwell requesting the suspension of Bridget's order. Rockwell replied the same day that Battery A had yet to be relieved of its duties at the Mariveles Section Base, and was not yet under Army direction. 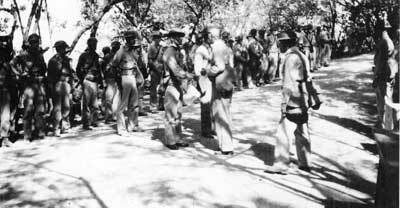 MacArthur ended the dispute by issuing Field Order Number 6, assigning two officers and 40 enlisted men from Corregidor to serve as guards for USAFFE Headquarters, relieving Battery A. 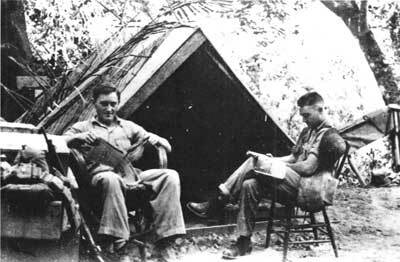 Two Marines try to catch up on their reading during a lull in the bombardment. Platoon Sergeant Robert A. Clement was ordered by Bridget to command a hastily gathered platoon of 36 sailors to support the two Marine lieutenants. Clement asked for another Marine noncommissioned officer, whom he did get, and led his men into the jungle. Sergeant Clement deployed his men in loose formation and moved toward Longoskawayan Point. In a few minutes, he heard a sailor calling, "Hey, Sarge!" "Hey Sarge!" Clement quickly ran over to him. The sailor held up his rifle and asked, "Sarge, how do you get the bullets in this thing." Clement rapidly held school for the sailor and the platoon moved on. A Marine receives a haircut from a Filipino barber during a lull in the shelling and bombing. Clement's men soon reached the beach where they came upon the Japanese supply area. 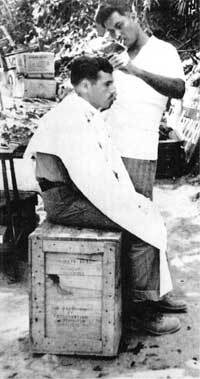 More than 150 rifles were neatly stacked as well as Lister bags of fresh water hanging from poles. Two Japanese cooks were the only enemy in sight and these men ran at the approach of the Americans. Clement ordered each of his men to carry off one of the rifles and returned to report his success. Japanese machine guns caught the patrol in an ambush a short distance up the trail, and Clement and a Navy lieutenant were hit in the initial exchange of gunfire. The firing alerted the two Marine patrols. At the sound of battle both Holdredge and Hogaboom deployed. They met scattered Japanese patrols and drove the Japanese back toward the coast, towards Clement's men. Machine gun fire hit the Marines, killing Private First Class Quentin R. Sitton. Despite the Japanese fire, the two forces joined and together withdrew to a blocking position on the ridge between Mariveles and Longoskawayan Point. Bridget gathered the men available at the Section Base and reinforced the detail of the two Marine lieutenants with 30 sailors. At this point, the Marine commanders believed they had encountered only about a platoon of the enemy. On 24 January the Marines and sailors again advanced on the point. Strong Japanese resistance was encountered and rifle fire and grenades were exchanged between the two forces. At the first sight of a hand grenade, a Marine shouted, "Grenade!" and dove for cover. The sailors stood looking around, asking, "Where?" The untrained sailors learned quickly how to take cover thereafter. Lieutenant Holdredge came upon a Japanese light artillery position and maneuvered to engage the enemy. He soon realized his men were behind enemy lines and pulled back to the main Marine position. Firing was spasmodic the rest of the day and at dusk the Americans pulled back to their blocking position. The two lieutenants realized they needed more men to engage the enemy the following day and requested reinforcements from Corregidor. On the morning of 25 January a machine-gun platoon and an 81mm-mortar platoon arrived under the command of First Lieutenant Michael E. Peshek. Marine Gunner Harold D. Ferrell directed two 81mm mortars on the positions the Japanese occupied during the previous day's engagement. By midafternoon the Marines again moved toward the points, Hogaboom to Lapiay Point and Holdredge to Longoskawayan Point. Hogaboom found no enemy, but Holdredge's men were met by an ambush and had heavy losses. Holdredge and 11 enlisted Marines were wounded and Private First Class Warren J. Carver was killed. 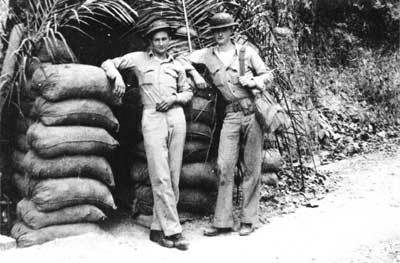 Two Marines relax outside a bunker on Corregidor before the heavy Japanese shelling destroyed most of the foliage on the island. The Marines again withdrew to their blocking position and shortly after midnight, 12-inch mortars from Corregidor pounded Longoskawayan Point. On the morning of 26 January, Marine mortars combined with Filipino artillery again hit the Japanese defensive positions. The 60 to 75 Marines and 130 sailors probed the Japanese defenses, but the attack became disorganized. The Japanese counterattacked and again the Americans withdrew. Hogaboom reported that "we could not hope to continue the attack or even hold our ground with the troops at our disposal." Commander Bridget responded by ordering Hogaboom to dig in and prepare for another attack in the morning. As the tired men returned to their positions they were met by the 1st Battalion, 57th Infantry (Philippine Scouts), who relieved them. The remainder of the Naval Battalion withdrew to Mariveles and three days later the Philippine Scouts had cleaned out the Japanese landing force. The platoon that the Marines initially thought had landed turned out to be a reinforced battalion with attached artillery These Japanese were part of a larger landing force but had become separated during the night of 22-23 January and landed unsupported on Longoskawayan Point.